The grouping’s engagement in the region, consisting of 33 countries with population of 600 million, has become timely. Last week witnessed some crucial developments from BRICS perspective. The Cuban foreign minister visited New Delhi and sought BRICS’ partnership with Latin American countries, representatives from Cuba, Haiti, Costa Rica and Chile met Russian Foreign Minister, Sergei Lavrov in Moscow and sought Russian cooperation for the development of Latin American countries and Chinese President, Xi Jinping toured Trinidad and Tobago, Costa Rica and Mexico to widen Chinese engagement in the region. Like Africa, Latin America is emerging as a hub of economic development with huge natural resources; it is but natural that it has gained increasing attention of the world. In this context, BRICS’ engagement in the region, consisting of 33 countries with population of 600 million, has become timely. The establishment of Community of Latin American and Caribbean States (CELAC) in 2011 has provided the region a unified voice, and with Brazil being a member of BRICS as well as CELAC, the BRICS’ engagement in the region will be mutually beneficial with larger implications for the globe. Cuban Foreign Minister, Bruno Eduardo Rodríguez Parrilla told in New Delhi that “CELAC wants to improve relations with BRICS.” He also stated, “We wish to seek a higher level of economic cooperation with the India and the other BRICS nations, which we consider to be valuable.” India is the first dialogue partner of the CELAC, which has provided the group a format to develop closer relations with India in diverse areas particularly information technology, medical services and tourism as elaborated by the Cuban minister. He further announced, “We see an opportunity for mutually beneficial economic relations with India.” The CELAC has a similar format of dialogue with China, which can be further extended to Russia and South Africa. The CELAC, which consists of all countries of the two American continents, but without the US and Canada, has recently started exploring economic relations with other countries including economic power houses of the BRICS. Parrilla pointed out that there are many common values and objectives between CELAC and BRICS, which need to be further explored. The foreign ministers of Cuba, Haiti and Costa Rica and deputy foreign minister of Chile met Sergei Lavrov in the Russian capital to deliberate on various issues including promoting dialogue, trade and visa-free regime. The joint communiqué brought out the commonalities of interests in the areas of tackling terrorism, developing economic relations, promoting democracy, advancing principles of international law and the United Nations Charter, countering transnational organized crime, and tackling other threats and challenges. Lavrov stated at the end of the meeting, “Our friends have expressed their desire to make permanent contacts between the CELAC and BRICS … We believe this is a very attractive suggestion and we will definitely discuss it with other states that are members of this association.” Russian foreign ministry also expressed the idea of establishing a permanent mechanism for political dialogue and cooperation between Russia and CELAC. China has started pursuing vigorously its Latin American policy. It has already replaced the US as the largest trading partner of Brazil and Chile. Its trade with Latin America has grown since the last decade. From 2000 to 2011, it has grown 20 fold, from $3.9 billion to $86 billion. Chinese Assistant Foreign Minister, Zheng Zeguang on the eve of Xi Jinping’s visit to Latin America dispelled any notion of competition between China and the US in the region and stated that China can work with the US in a framework based on mutual trust, equality and inclusiveness. Xi was received by the Prime Minister of Trindad and Tobago, Kamla Persad-Bissessar. Besides this Caribbean country, Jinping also visited Costa Rica and Mexico. China is looking forward to widen its investment in the exploration of natural resources including energy resources in the region. The BRICS’ engagement with CELAC is not only a factor in promoting multilateralism and fostering a multi-polar world structure, but it also accrues economic advantages to both the groupings. While the BRICS members are fast rising economies with huge financial resources, the CELAC countries have also registered growth despite global economic slowdown. The Latin American countries are also rich in natural resources. The Union of South American Nations on Natural Resources and Integral Development in its meeting in Venezuelan capital Caracas last week emphasized on natural resources and their exploration for the development of the region. Latin America reportedly has 38 percent of copper, 21 percent of iron, 65 percent of lithium reserves, 42 percent of silver, and 33 percent of tin. It also contains about 30 percent of the total of the world’s water resources and 21 percent of the world’s natural forests. Some of the Latin American countries such as Mexico and Venezuela are rich in energy resources. The huge population of CELAC makes the region a vast market for investment and also for import from the BRICS countries. 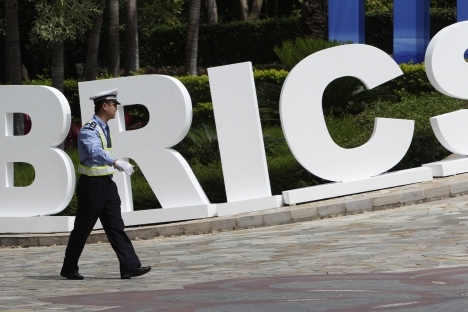 The rising prowess of the BRICS will grow with its Latin American engagement. Though many of the initiatives discussed above are related to individual members of the BRICS, this adds to the collective sphere of influence of the grouping. As the members’ Latin American engagement takes more dynamic shape, the prospects of collective engagement as a group can be explored. The grouping can evolve common strategies in exploring the resources in the region for mutual advantage. In this venture, the proposed BRICS bank can be an effective tool.